A large, attractive self-watering black coloured planter that needs minimal maintenance that can be rail-mounted, ideal for outside schools, workplaces, shops, town centres, villages and community gardens. FullBloom Self-Watering Rail-Mounted Planters have a stepped recess in the base that allows secure fixing to both standard sizes of guardrail in use in the UK – 50mm and 70mm. 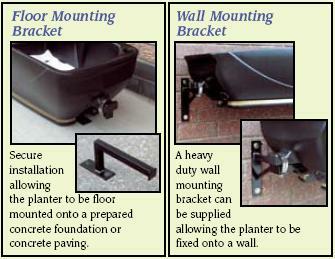 Integrally moulded fixing lugs and the Kwik-Fix™ Mounting System allows quick installation by one person. Lytham in Bloom is the overall 'Champion of Champions' in the annual Royal Horticultural Society awards, with judges describing the Fylde coast town as "the cleanest, greenest and most beautiful location in Britain."